When Amnesia: A Machine for Pigs and Outlast launched a week apart from each other, I was not going to play them. I’m a wimp when it comes to getting scared, so the idea of subjecting myself to hours of cowering in the dark while terrifying creatures hunted me down? Please, not going to happen. But as all the reviews and coverage flooded in, I grew curious. Not curious if they were good – by all accounts they were – but curious how two games that looked so similar on the surface compared to each other. If I wanted to dip my toe in the survival horror genre and play one game, which game was right for me? So against my better judgment, I offered to play both games for Kotaku and break them down side by side. 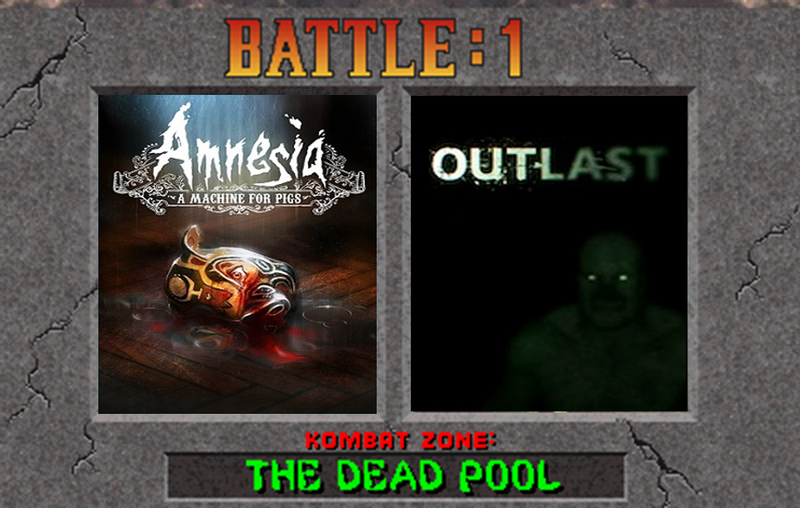 After about 15 hours of cussing and jump scares, one game stood tall against the other as the obvious choice. A good horror experience has a knack for creating an atmosphere that is as memorable as its characters, like the Overlook Hotel in The Shining or the “chase-chase-chase-kill-kill-kill” sound effect in Friday the 13th, so this feels like the right place to start when evaluating these games. Outlast: Mount Massive Asylum is aggressively disturbing. It features more torture and mutilation than all of the Saw movies combined, and the handiwork of those atrocities is everywhere. Disembodied hands and legs float in the toilets, decapitated corpses litter every corner, and even the inmates who are still alive are disfigured to a stomach-churning degree. And if you aren’t stepping through blood and guts, you’ll find other bodily fluids coating the floors and walls instead. But beyond the asylum, the inmates really steal the show. Outlast is not a solitary experience, and surrounds you with the asylum’s inhabitants. Some inmates are hostile, some are not, and not knowing if the guy sitting in the corner watching you is going to attack or let you pass keeps you on constant edge. I passed by a window to a room I needed to enter, and spotted a gruesome-looking fellow playing piano. He stopped, got up, and walked slowly towards the window, staring at me for a good 15 seconds before disappearing into the darkness. Knowing that he might still be in there when I walked through the door was an awful feeling. Amnesia: In stark contrast, Amnesia is almost entirely solitary, and the focus is more on exploring the mansion itself than your interactions with other people. There is very little visual violence outside of butchered pig carcasses, and the game relies heavily on you reading your journal entries and found documents to paint a picture of the grisly deeds that took place there. In fact, most of Amnesia’s atmosphere relies on you letting your imagination run wild. Shadowy figures dart out of view in the corner of the screen, and pig masks appear in places where you know they weren’t earlier to remind you that someone is watching your progress and is always near. EDGE: Outlast. Aesthetically, I actually preferred the industrial steampunk style of Amnesia to the asylum in Outlast, mainly because the asylum setting felt more familiar. We’ve seen that setting before in games like Batman: Arkham Asylum, and I’m a sucker for Amnesia’s time period. But in terms of building an atmosphere that is threatening and disturbing, Outlast’s constant interjection of menacing figures is far superior to Amnesia’s subtleties. Strong plots in horror games are massively important to me, because I don’t like being scared. If I’m going to put myself through five to ten hours of tormented exploration, there needs to be a good story encouraging me to push on. Outlast: You’re Miles Upshur, a journalist who receives a tip about shady happenings at a recently reopened insane asylum, so you set out to get to the bottom of it. The journalist who gets more than he bargains for while investigating a story is a well-worn horror trope, and Outlast checks most of the boxes you’d expect from a game taking place in an insane asylum, like horrific experiments, notes from hospital staffers questioning the ethics of their superiors, and breathless accounts of a mysterious project that could change everything. It’s all familiar but it serves the purpose of illustrating how horrible the environment you’re in is. Things start to unravel in the third act however. The big twist (note to developers; not every horror script needs a twist) left me groaning rather than gasping, and I spent a lot of the last half an hour wishing that the story wasn’t going in the direction it did. Amnesia: Amnesia also takes a common game trope (amnesia. I know, I was shocked too), but builds the story around lead character Oswald Mandus’ search for his missing children and a mysterious voice on the telephone that instructs him to restart an even more mysterious machine below his mansion that has been sabotaged. Amnesia’s story feels much fresher, and it becomes clear early on that this machine is more diabolical than it first appears. Work memos and journal entries paint an unpleasant picture of the machine’s true purpose, and of the sacrifices necessary to keep it running, and that curiosity drove me to continue far after I’d grown familiar and even bored with the gameplay. You’ll see the twist coming from a mile away (because again, there has to be a twist), but unlike Outlast, it didn’t leave me rolling my eyes. EDGE: Amnesia. Amnesia’s plot is one of its strongest selling points, whereas Outlast’s plot is one of its weakest. Outlast: Have you ever wondered what playing a movie like Cloverfield or The Blair Witch Project would feel like? Outlast is your answer. You can see your hands and feet, you scramble over obstacles, and everything can be recorded through a video camera. Miles is also a quick runner, so coming face to face with a threat often leads to a breathless parkour pursuit as you tear through hallways and around corners desperately searching for a place to hide. And since you can climb, the environment opens up with more platforming opportunities like leaps across chasms and stacked tables leading to accessible air ducts. Amnesia: Amnesia feels more like controlling an interactive ride than an actual human being. Items you pick up float in front of you, there are no contextual ledges that respond to jumping (jumping is worthless for the most part), and enemy encounters are limited to single rooms, so escaping is as simple as running to a dark corner on the other side, ducking, and letting the enemy walk past. It’s also fairly linear, and you’ll never have to go more than one room over to find what you’re looking for in the few environmental puzzles you’ll face. You are also given a lantern and warned that using it in the dark can attract unwanted attention, but in an interesting departure from the first Amnesia, this lantern has unlimited fuel. This means that your only incentive not to use it is the potential of attracting enemies, but since most of the game is bright enough to be able to see without it, it didn’t add much to the experience. EDGE: Outlast. I left a lot of little corners in Outlast unexplored since I was hoarding batteries so tightly, whereas I could dive into every nook and cranny in Amnesia without fear of handicapping myself later. But as much as I hated having the constant dread of dead batteries hanging over my head, I have to admit that it added a lot to the intensity of the entire experience. Amnesia’s lantern, on the other hand, barely factored into my game at all. Outlast: The real beauty of Outlast's characters is that most of them deliver chillingly casual monologues about how they are going to kill you slowly. Two inmates in particular speak in such a relaxed manner that they're almost soothing, if you ignore that they're naked and carrying machetes. There are no weak links in this cast, everyone from the most minor prisoner to the main villains delivers in spades. Amnesia: Since you never actually see another person in Amnesia, the voice acting needs to carry the story, and it succeeds. Despite never raising his tone, the speaker on the telephone delivers his lines with incredible force, and Magnus' terrified questioning fits the bill of a father desperate to find his children. You'll only hear three or four voices the entire game, but you'll remember them all. EDGE: Toss-up: The most pleasant surprise I experienced in either of these games was how well-acted and memorable the characters inOutlast were. But Amnesia deserves extra credit for being able to carry a story through nothing but phone conversations and the occasional found recording or inner monologue. Voice acting was a considerable strength in both titles. Outlast: Outlast derives a full-on horror blitz. There is rarely a moment when you aren’t running for your life, cowering in a hiding space, or looking over your shoulder to make sure you aren’t being followed. Downtime doesn’t exist, and every time you flip a switch or turn a crank, you can expect a pipe-wielding psycho to come investigating. The running mechanics that I wrote about earlier? You need those, because you will never feel at ease while wandering the asylum’s hallways. Death is always lurking around the corner. Amnesia: Amnesia succeeds early at building Nope moments, creating a sense of foreboding and dread behind every door and bump in the dark while letting you imagine what is waiting for you on the other side. But while it succeeds in building foreboding, Amnesia rarely backs it up with anything substantial. There are, without exaggeration, about five to ten actual enemy encounters in the entire game, with the rest of the scares reserved for off-camera sound or shadows darting out of view. Once I realize that, along with the fact that enemies only appear in the dark, I could bomb through areas without fear of confrontation. I never felt entirely comfortable in a room in Outlast, but I could write off entire sections of Amnesia because I was reasonably confident that I’d be left alone. EDGE: Outlast. When you do see an enemy in Amnesia, escape is as easy as running to the nearest lit area, which is usually right around the corner. In Outlast, you see an enemy, run around three corners while hurtling over tables and slamming doors behind you to slow your pursuer down, then dive under a bed and watch in horror as he walks into the room and starts checking hiding places for you. Ultimately, Amnesia threatens to scare you but makes your imagination do most of the heavy lifting. Outlast scares you repeatedly, relentlessly, and effectively. For the first hour of Amnesia, I was convinced that it was going to be my game of choice. The late-1800s setting was pushing all the right buttons, and the game seemed much more disciplined with its horror, using ambient scares to heighten the tension without shoving anything in my face. Oh man, I thought, when they finally decide to ratchet up the intensity, this is going to be terrifying. But that ratcheting up never came, and once I called the game’s bluff, I realized how few moments of actual survival there were in this survival horror title. And since it’s so linear – Outlast has its linear moments, but it also opens up small sections that give it a more open feel - and I felt like I was just being shuttled from one scare to the next with a few distractions in between. Maybe Amnesia would have been scarier had I played it before Outlast instead of after it, but after my visit to Mount Massive Asylum, Oswald Mandus’ mansion felt tame by comparison. Outlast’s gameplay is more fluid and immersive, the enemies are more menacing and memorable, and it’s much, much scarier. You won’t be disappointed if you buy Amnesia, but if you want a game that will really stick with you when you turn off the lights, Outlast is the game for you. Both games were played with download codes provided by the publishers. Cameron Gidari is a freelance writer and the author of Manhattan Before8 and Seattle Before8. You can follow him on Twitter at CGidari.